What Are My Wildest Dreams? That is one of the questions I am answering as part of Blogging 201. Admittedly the full question is ‘what would my blog look like in my wildest dreams’? But if I’d started with that, you probably wouldn’t have bothered reading this. 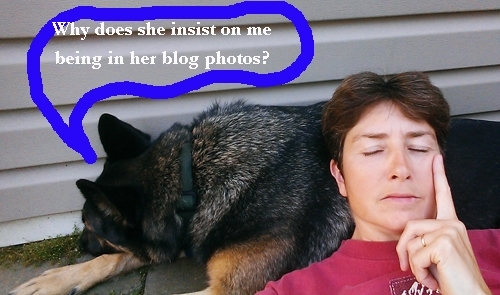 Alison Nicholls and Chase consider a blogging question, with differing levels of enthusiasm. Blogging 201 has just started. It’s written by the WordPress.com team and they send an email a day for the next month, containing information, inspiration and advice about blogging; tackling a different issue every day. I’m really looking forward to the rest of the emails. And so is my dog. Whenever I posted an image of a new painting or sketch, it would sell by the end of the day. My Art Safaris would be full within a month of posting details. A publisher would offer me a book contract to create a series of books based on my visits to conservation organizations in Africa. A production company would ask me to make a TV series in Africa featuring my art and conservation. I would have several hundred comments and at least 100 shares on every blog post. I could go on, but maybe I’m just being greedy! It might seem like a wildly optimistic list but wait…you can help! Start me on the road to hundreds of comments and shares by commenting and sharing now. Unless you are an art collector, publisher or producer – in which case please drop me an email! This entry was posted in Art Safaris, Blog Posts, Exhibitions, For Artists, Uncategorized and tagged blogging, inspiration, Wordpress on July 24, 2015 by Alison.